Tires are a lot more important than most people think. One of the most important items affecting your ride is the contact with the ground. A good truck or Jeep tire can be what allows you to take a new trail, a bad tire can be what ruins a trip in a heartbeat. There are a lot of choices for tires out there, however. It can be a little intimidating choosing the right one, but the good news is that there a lot of choices, so you can always find a good match for your needs if you know how to look. Every tire has some markings along its sidewall. These denote the size, load range, and type of tire you’re looking at. For example, you might see (whatever tire size you use in your photo) or something similar. These sizes should correlate to your wheels and a tire technician should be able to tell you how big a tire you can fit in your wheel wells without any chassis rubbing. Once you have the sizing and type of tire you need, the next decision to make involves what you plan on doing with that tire. There are 3 main types of treads, and we’ll go over each. 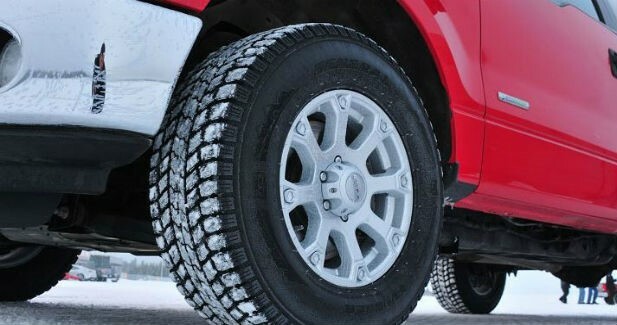 All-Season tires are made for mostly on-road performance to handle most weather conditions on the pavement. They are very good for hauling and towing and for maintaining confident contact with the pavement. All-Seasons are the best for quiet rides, better fuel economy, and on road handling. All-Terrain tires strike a good balance between on-road and off-road performance. These are good for people who spend a lot of time off the road, but don’t want to ruin their handling dynamics on the highway. All-Terrain tires are the best choice for people who may use their truck to work on a farm or ranch, or often go adventuring in forests or dirt and gravel roads. All-Terrain tires can have a couple modifiers that show where it’s able to go. The deep snow logo with a 3 peak mountain with a snowflake that marks the tire as capable of traversing through deep snow and severe winter conditions like ice. M stands for mud, and means that the tire is capable of pulling itself through mud. S stands for snow which means this tire can make contact through most snows that aren’t too deep. 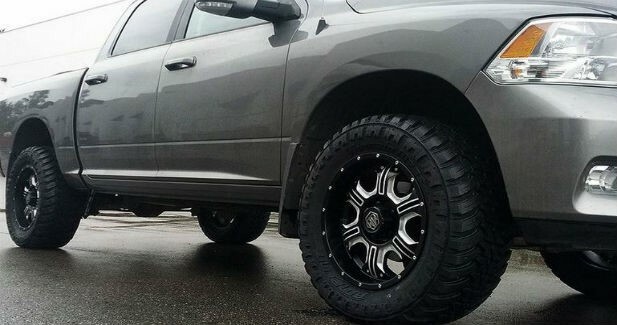 The main drawback for all-terrain tires is that when it comes to on road performance, these tires tend to be louder, decrease fuel economy, and don’t contact the pavement as well as all-season tires. This is due to the larger tread blocks and wider voids between the treads. All-Terrains are our number pick for most trucks and Jeeps. 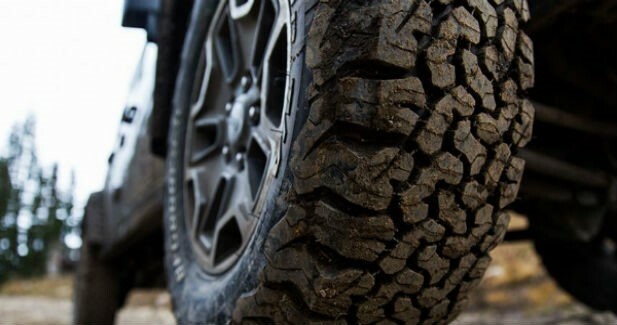 Mud-Terrain tires are built for off-road performance. These tires are meant to go where other tires just can’t get to. If you plan on using your rig as an OHV or trail vehicle, then these tires are the way to go. With giant tread blocks, studs and knurls on the sidewalls and shoulders, thick, reinforced sidewalls, and huge voids meant to grab anything they touch, mud-terrain tires can get you through mud or snow without digging holes, over rocks without popping a sidewall or blowing a seam, and even churn through streambeds on those treacherous water crossings.